+ Evaluation with a focus on programs, funding, and marketing. + Funding development from grants to sponsorship. + Consulting and Project Management on food and farming project from concept to implementation. + Basic marketing support from social media to press releases. + Writing including creative, technical, editorial, and ghost services. + Public speaking, guest lectures, technical trainings, etc. Who is Wit Meets Grit? Wit Meets Grit is a company created from a passion for helping others find their voice, their opportunity, and their community. WMG is empowering nonprofits and businesses to reach their goals by providing guidance on organizational management, project development, community engagement, marketing, and funding. The founder and writer of her own destiny, Nikki Seibert Kelley is a true “jill-of-all-trades” who has yet to find a challenge she cannot tackle with enthusiasm. Her breadth of knowledge, outgoing personality and inquisitive mind allow her to jump into any project, story or event without missing a beat. Plus, she is known for cracking jokes while getting it all done. With over 15 years of experience working in the non-profit sector and a lifetime of her hands in the dirt, she has enjoyed supporting the community through local food system building, sustainability programs, affordable housing, women’s leadership development, coalition building, and freelance writing. In the last two years, Wit Meets Grit has worked with 12 organizations and businesses to increase their capacity and efficacy in reaching their goals, including the development and facilitation of several multi-agency projects such as the SC Food Hub Network, the SC Local Food System Mapping Project, and the Bamberg County Health Coalition. Prior to launching Wit Meets Grit, her role as the Director of Sustainable Agriculture with Lowcountry Local First allowed her to build incredible programs for the Eat Local Initiative under the leadership of Jamee Haley. 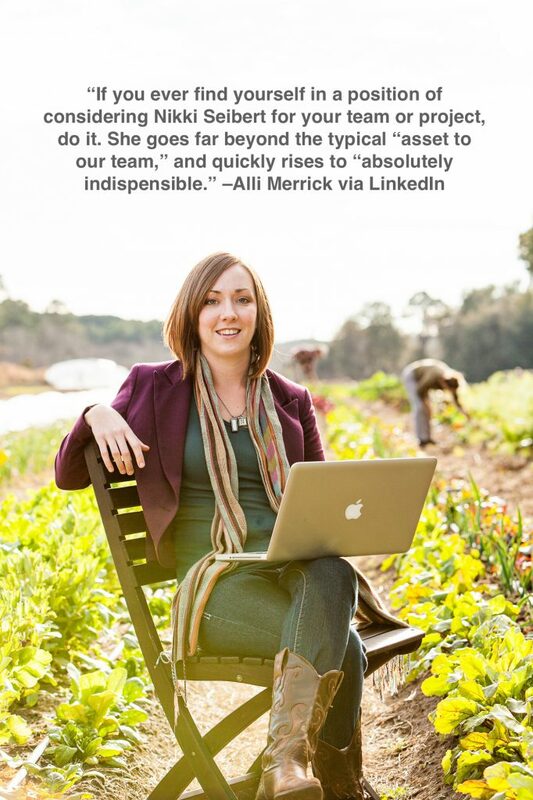 She helped train 142 new and beginning farmers, coordinated over 40 farmer workshops, developed consumer outreach tools, launched South Carolina’s first incubator farm “Dirt Works” and provided mentorship for 20 graduate and undergraduate students. She is currently an Adjunct Professor at the College of Charleston, takes an active role on the Board of Southern Sustainable Agriculture Working Group (SSAWG), SC Food Policy Council, The Green Hearts Project and Charleston County Farm Bureau. Mrs. Kelley is also an accomplished freelance writer and amateur photographer. You can also check also out her full credentials and recommendations on her LinkedIn page. Nikki lives in Charleston, South Carolina with her husband, two dogs, and one saucy cat. 2. a natural aptitude for using words and ideas in a quick and inventive way to create humor. 2. passion and perseverance in achieving ones goals.